Home > Target > In-Store Deals > New Target Coupons = Great Deals on Costumes & Pumpkins! 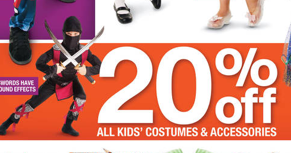 New Target Coupons = Great Deals on Costumes & Pumpkins! There are new Target Cartwheel coupons out today that make for awesome last minute deals on kids costumes, pumpkins and even a few new toy deals. Don’t forget that you can pair cartwheel coupons with other Target coupons and even manufacturer coupons. Pair the new costumes Cartwheel coupon with a $5 off $20 purchase of Costumes Target Mobile coupon (text Coupons to 827438). Costumes are on sale this week 20% off. So after all the coupons you’ve got a costume (or for us lots of fun dress up clothes) for over 50% off. Text PASTA to the same 827438 and you’ll get a $1 off produce coupon that can be paired with the Pumpkins offer too!